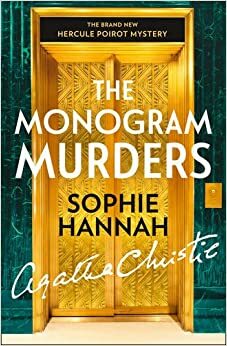 The Monogram Murders by Sophie Hannah is the first novel since Agatha Christie's death featuring Hercule Poirot. I've read a couple of Sophie Hannah's previous books, one of which was a crime novel and one of which was a ghost story, and I was interested to see what Hannah, whose books I think of as much more overtly in the psychological thriller style than Agatha Christie's work, would do with Poirot. As Christie does in some of her books, Sophie Hannah uses a character close to Poirot as narrator. Inspector Catchpool of Scotland Yard is currently living in the same genteel lodging house as Poirot and enlists his help in solving what appears to be a triple murder at a West End hotel: three guests are found dead in their hotel rooms with a monogrammed cufflink hidden in each of their mouths. Poirot is already preoccupied with his own mystery, that of Jenny, a customer at his favourite coffee house, who has apparently disappeared after confiding that she fears she is soon to be murdered - and it's Poirot's belief that the two cases are connected. I can't fault the way Sophie Hannah handles Poirot. It's very clear that she knows the character inside-out, and his methods, behaviour, speech patterns and values are absolutely consistent with Agatha Christie's novels. The period detail of The Monogram Murders is also absolutely spot-on, and most of the supporting characters could certainly have stepped straight from the pages of an Agatha Christie original too. The tangible clues to the mystery - a detail in a painting, a shaving cut, ambiguously-expressed remarks - are also very much what you'd look for in a Poirot mystery, and as in many of Christie's books, there are warnings about jumping to conclusions and seeing what isn't there as well as what is. It's the complexity of the mystery, however, that's really The Monogram Murders' downfall. It lacks the tautly concise feel of Agatha Christie's books. It lacks also the neat, deceptively simple logic I expect of a Hercule Poirot novel. When Christie's mysteries are solved, the default reaction from readers is "Oh, of course ... I can't believe I didn't think of that." They're designed to make you want to kick yourself. There's none of that here, however; there's too much padding and too many contrived twists which mean the conclusion of the mystery (traditionally delivered by Poirot, of course, while all the suspects are gathered in a room together) is dragged out for far too long.